The Witch's Island: 4 More Sleeps! Yes, it's just that close and we're just so busy that I'm only going to make this a short little post. 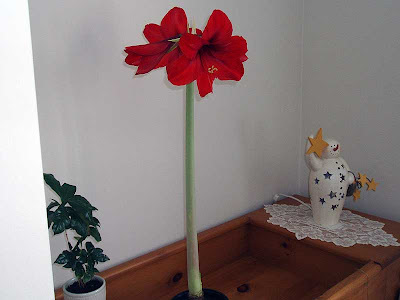 I wanted to share pictures of my amaryllis, ain't she a beauty? The first picture was shot on the 18th and three days later the blooms are fully open, just in time for Christmas. Love the plant and the decorations :-) Your house looks very festive! 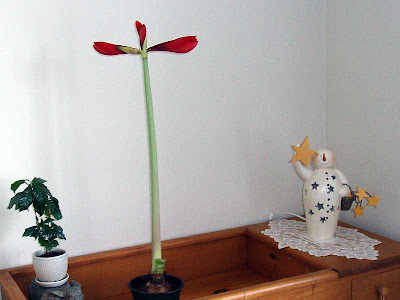 Your amaryllis is really lovely, and such a beautiful flower to have at this time of the year! 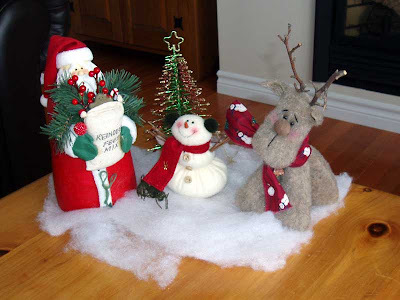 I love your decorations too--You're right about the reindeer, he's a cutie!! :-) I hope you have a warm and wonderful Merry Christmas! !